Call Handlers – Starting at £8.50 per hour with weekend and overnight enhancements, increasing following completion of 6 months successful probation. Despatchers – Starting at £9.00 per hour with weekend and overnight enhancements, increasing following completion of 6 months successful probation. Shift Managers – Starting at £10.25-£12.50 per hour, increasing following completion of 6 months successful probation. BrisDoc provides the Integrated Urgent Care service for the NHS. We pride ourselves on being a fantastic place to work somewhere that you will feel valued, supported, developed and part of a family. We strive to make sure every member of the team feels proud of the work they do and the service that we offer to over 1 million patients across Bristol, North Somerset and South Gloucestershire. Successful applicants in these roles will recognise the importance of a patient-focused service, have excellent interpersonal and customer service skills, a good standard of IT literacy and willingness to sometimes work in more than one of our bases within Bristol, North Somerset and South Gloucestershire. Hours: Hours of work will primarily be weekends and limited weekday evenings. You will also be expected to participate in working bank holidays on a rotational basis. (Our services operate on a rolling 4 week rota). Other benefits: NHS Pension (offering 14.38% employers contribution). Locations: Current vacancies available but not limited to Knowle West Health Park, Osprey Court in Whitchurch, Cossham Hospital in Kingswood, Clevedon Hospital, Southmead. Newcourt Surgery in Weston-Super-Mare and Stoke Gifford. Telephone Interviews will be held for short-listed candidates, followed by Face to Face Interviews on a rolling basis. 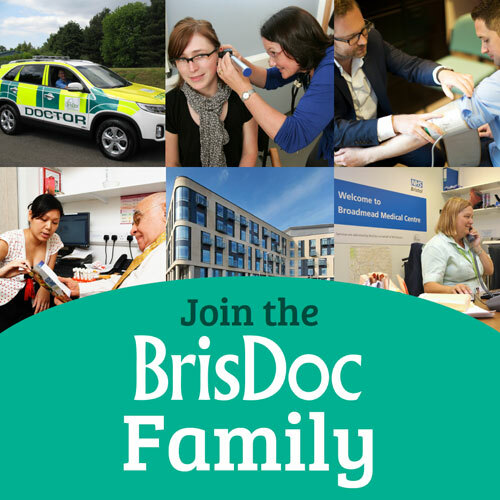 To Apply: Please download an application and submit to workwithus@brisdoc.org For more information, please contact the HR Team on 0117 9370902.